Friendships are beautiful things. You meet a person, get to know them a bit, mutually decide you like each other enough to spend extensive time together, and then, if you're lucky, develop a relationship where you can rely on and support one another. In the beginning there are endless topics to talk about and tons to learn about one another. With time, however, it can feel like you've run out of things to say. So what can you do to make sure that your friendships continue to grow and develop? Here are 3 tips to do just that. A surefire way to grow a relationship is to engage in new experiences together. Trying out a class, eating at a new restaurant, visiting a museum, and even walking around a town you haven't visited before can all serve to stimulate conversation and create fun. It also gives you the opportunity to solve problems together (at least for me, when I inevitably get us lost on the way) and make decisions, strengthening your relationship. It is all too easy to have the same conversation over and over again. "How was your day?" "What's going on in your classes?" etc. But asking new questions will allow you to learn about your friend in a different way. Try using some of the 36 questions from this New York Times article. Even though it's about "love" there are still great conversation starters for friends. When you are discussing something with your friend, your inclination may be to jump right in to give your opinion, but delving deeper into her point of view and asking her why she feels the way she does can help you better understand your friend and, therefore, deepen your friendship. Having a sense of genuine curiosity and behaving accordingly can do wonders for any relationship. 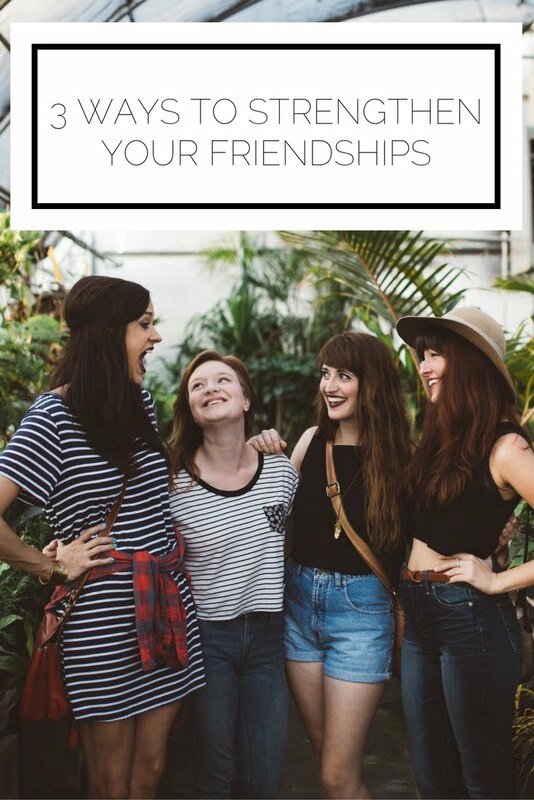 These are my top 3 ways you can strengthen your friendships. You chose your friends for a reason and these suggestions will keep those at the top of mind! How do you strengthen your friendships? Is this something that challenges you?